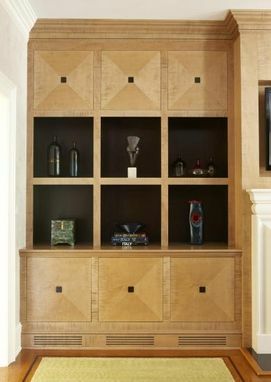 This extraordinary wall of unique cabinetry was created through the use of rare highly figured tiger maple both solid and veneer. To highlight the grain and veneer pattern a honey colored dye stain and hand rubbed lacquer topcoat was applied. Visually pleasing as well as functional the compartments are equally divided. This versatile wall has space for concealed storage as well as open compartments finished in a dark accent color to classically display art, books, and photographs. 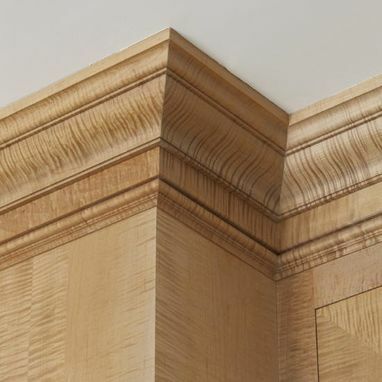 The unsurpassed natural beauty of this rare tiger maple is evident in the detailed installation of layered crown and backer band moulding. 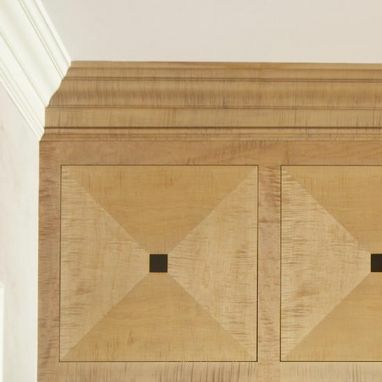 Meticulous attention to detail by our craftsmen is evident in the layout and execution of the veneer pattern that has been created as well as the matching of the installed adjoining crown moldings - paint to tiger maple is flawless.